First, what’s wrong with Morocco? Nothing at all, lots of people would say. Grand place to visit. A rep for being “authentic” among the countries of north Africa. But some of us have an aversion to what appears to be a certainty when visiting Moroccan cities: Aggressive street salesmen. There was the Incident Outside the Hagia Sophia in Istanbul a few years back, in which a spurned carpet salesman declared that a passing tourist “must listen to me!” and offered decapitation as an alternative to his sales pitch. This actually happened. We kept on walking. There are others who would prefer high waves on a lee shore rather than say “no, thanks … no thanks, no, really, no thanks” to a gantlet of young men getting in tourist faces. So, looking hard at Morocco, which can be reached by nonstop flights from France, a simple hop over The Med, thinking of a photo outside the Casablanca knockoff of Rick’s Cafe Americain from the movie “Casablanca”, and then we heard something along the lines of Morocco’s salesmen are relentless. So, maybe not the Kasbah, this time around. Stand down on deal-searching on the web. Oh, well. Two hours of quiet. Logistics. Lots and lots and lots of logistics, but some excellent prices, even with the two extra flights and the five-hour-each-way travel versus the 90 minutes to Fez or Marrakech or Casablanca. Because Egypt has lots and lots of ancient history, and some of us are greatly interested in ancient history. Egypt has so much ancient history that even decades, milleniums of thievery of grandly important items … Egypt still has more ancient history than a body can absorb in seven days, or 70 years. So, the plan: The-more-budgety-than usual plane from France to London Gatwick on a Saturday night. Lunch with an old friend at a bustling English pub on a sunny Sunday afternoon, a fantasy baseball draft till 1.am., out by 7 a.m. on a Monday morning and into the Vegas-sized nightmare that is the North Terminal at Gatwick, and then wedged onto a Boeing 757-200 — a variety of plane that no one has crashed lately, but also one that was one passenger shy of a maximum load and had no entertainment package, nor free food or drink of any sort. Oh, and because hare-like thinking was engaged, we never tumbled to the fact that Hurghada is to budget English travelers what Vegas is to Yanks, except the English tend to come with alarming (even in 2019) tattoos right up to their pierced earlobes and also bring their kids. But we survived, and there’s that. 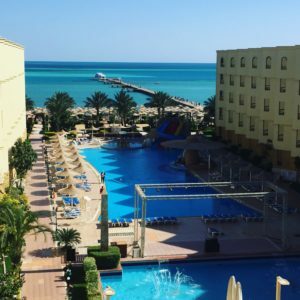 We landed safely and on time at sunny and sandy Hurghada (think Palm Springs in Arabic), a semi-bustling package-tour destination on the Red Sea and a balm for Brits who had despaired of seeing the sun anytime ahead of the Wimbledon Fortnight. We were delivered to the sprawling but a bit chaotic airport and dropped at the slightly tatty but historic old hotel, where we became perhaps the only Americans in the place. Settling down with hundreds of Russians, who like the Brits also take their young children with them, when they are dosing themselves with sun. So far, so good. Well, aside from the stress of tight flight times, packed planes, short sleep, a six-hour baseball draft with lots of crashed wifi, confusing buses, an overweight bag (missed by 1.2 kilos! ), the sheer barking-mad insanity of Gatwick’s assembly-line tour operators and internet trouble at the hotel (the oldest in Hurghada?) … it has gone fine. We did see a real, live whirling dervish as part of the night’s live entertainment. Quite remarkable is a repetitive sort of way. Not dull, certainly. Not at all. When sometimes dull is what would work best for the average human being. Even for hares, too.